Queen Street has changed a lot over the years. While it is still a vibrant and dynamic street, it is facing new challenges that require creative solutions. Rents and property taxes have been a big challenge in many areas of the city, particularly the Beach. Commercial property taxes have increased at about twice the rate of inflation, which becomes the sole burden of the business that is renting. Some landlords do not necessarily see the wisdom of charging rents that accommodate the businesses they house. There are also a number of unique, restrictive rules for businesses and developments in our area. We are working with Ward 32 councillor Mary-Margaret McMahon and the City of Toronto to change this in order to help our businesses. In addition, we have a number of speculating property owners that are buying and holding, expecting to sell bigger lots to developers. This neighbourhood is in transition. The volume of home sales is at a record high and we have at least five condo developments underway. We have assisted the councillor in crafting plans with clear guidelines under which developers are expected to work. This effort makes it clear for all parties to understand what the residents and businesses in the area are prepared to allow, and we hope that speculation and development will move more smoothly. As we adjust to our increase in residents, new demographics (you may have noticed stroller traffic jams on our sidewalks) and new ways of shopping, many businesses needed to adapt their ways of doing business to continue to be successful in our community. Change takes time! Change takes patience! Change takes support! Our streetscape committee works hard at improving and beautifying our street. We made a significant investment in the new refresh of Kew Gardens to create a more accessible and beautiful park for all. From planters and hanging baskets, graffiti removal, new garbage bins, fixing bike rings and adding new ones and creating parkettes, this committee is always looking at ways of beautifying the neighbourhood for everyone. 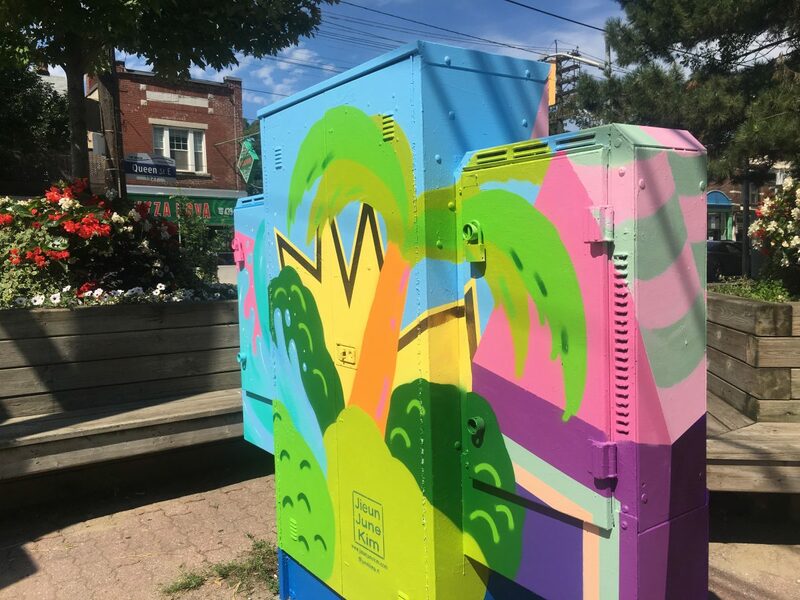 We are committed to adding art to our street, from painted planters to vibrant Bell Boxes and electrical boxes, and plan to take on more art endeavors in the future. We have also invested in making our sidewalks more accessible. The BIA runs a number of annual events to encourage “feet to the street”. Recently, we have had up to three events per week with movies and music in the park and those will continue until the end of the summer. We put on large events throughout the year to thank our residents for their patronage and we are always looking at new event ideas that will draw a crowd. We can all help Queen Street thrive. Before you get in your car to go to the mall or purchase online, think about how our local merchants would benefit from your patronage. We look forward to seeing you along Queen Street. Suzanne Beard is the chair of the Beach Village BIA.